After a early back and fourth battle, Oregon pulled away thanks to 28 unanswered points as they went on to beat the Michigan State Spartans 46-27. As reward for their signature win, the Ducks passed Alabama to secure the No. 2 rank in the latest AP poll. What does that mean? If the season were to end right now, Oregon would likely be voted by the committee to play in the first ever College Football Playoff. There is still work to do, and with the recent resurgence of USC the Ducks can’t look ahead yet. 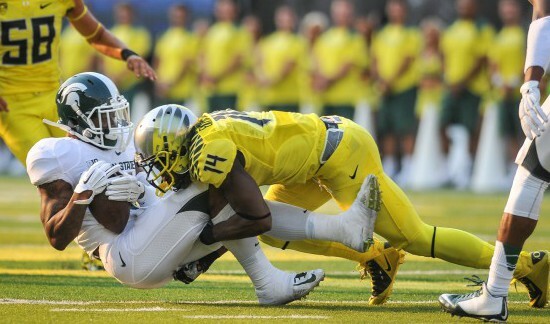 Oregon has one month to go until their biggest foreseeable test, an away game at No. 12 UCLA. Between that time, Oregon plays an average Wyoming team, winless Washington State, and an Arizona team that struggled to win at UTSA – yeah that’s right, the University of Texas San Antonio. If Oregon is able to continue its’ dominance on offense, the playoffs look very favorable for the Ducks. The defense will improve with more playing time, as they always do, and Marcus Mariota will continue to find his weapons as he strides towards New York’s Heisman ceremony. 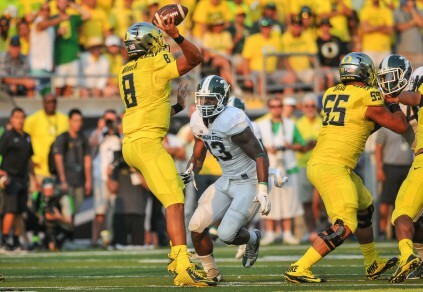 Despite heavy pressure Marcus Mariota led the Ducks offense with 3 passing TD’s. No. 1 Florida State, No. 3 Alabama, No. 4 Oklahoma, and No. 5 Auburn all won by more than 25 points and handled their opponents with ease. For Florida State they still face the rising Notre Dame Irish who impressively shutout Michigan this past weekend. Besides that matchup, Florida State’s schedule looks harmless for now. Oklahoma’s schedule still boasts a few tests for the Sooners. After next week’s home game versus SEC foe Tennessee, the Sooners will have to travel to West Virginia and play a team that gave Alabama early troubles in Week 1. They also have home games versus No. 9 Baylor and state rival Oklahoma State. As for Alabama and Auburn, it seems the two teams will most likely let the Iron Bowl determine their fate once again as both teams boast strong offensive weapons and tough defenses. Texas A&M and LSU will most likely be their toughest competition outside of each other. The sixth ranked Georgia Bulldogs had the week off, but they will be tested in week 3 as they visit Williams-Brice Stadium in Columbia to take on a South Carolina team that responded well after a suffering a season opening loss to Texas A&M. Led by Heisman candidate, Todd Gurley, Georgia stands out as the leading representative for the East division in the SEC Championship game that will most likely determine one spot in the playoffs. 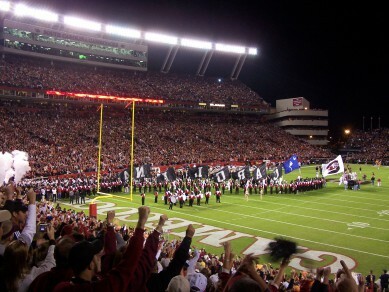 William-Brice Stadium will likely be loud as the Gamecocks host No. 6 Georgia this week. Cross Country – In the ninth annual Bill Dellinger Invitational on Pre’s Trail in Alton Baker Park, the third ranked University of Oregon Men’s team finished in first place with a score of 20 points. Sixth ranked Michigan State came in second with a score of 46 points followed by American who finished with 80. In the Women’s race, the third ranked Ducks finished in third place behind sixth ranked Michigan State and Portland. 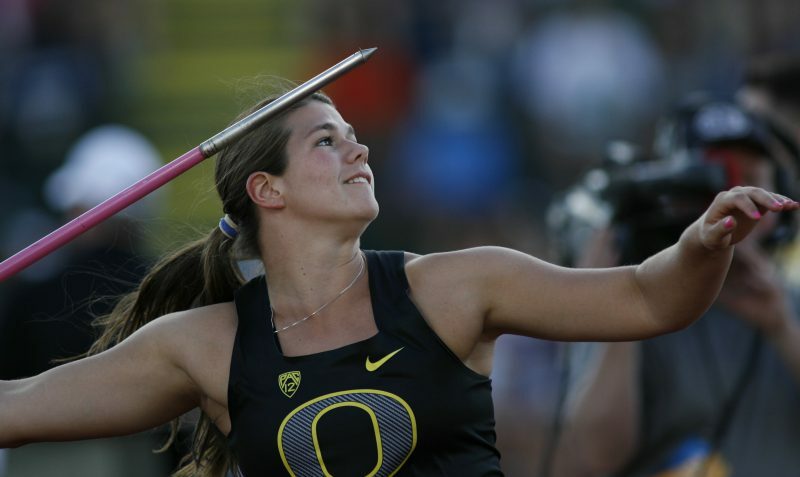 However, the Ducks did hold out star Megan Patrignelli, NCAA Championship runners Annie Leblanc and Mia Elbon, and two major freshmen Sarah Baxter and Frida Berge. Volleyball - The undefeated season continues after a successful trip to Hawaii for the Oregon volleyball team. After overcoming a close game versus the host team, No. 20 Hawaii, Oregon then beat New Mexico to extend their win streak to six games. Up next for the Ducks is a matchup versus No. 14 Michigan State on September 12 at Matthew Knight Arena. Senior Liz Brenner, also a Track & Field athlete, helped lead the Volleyball team in Hawaii.